To use the wireless charger, the power mode must be in ACCESSORY or ON. 1. To turn the system on and off, press and hold the (power) button. When the system is activated, the green indicator light comes on. 2. Place the device you want to charge on the charging area. 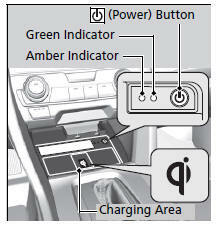 The system will automatically start charging the device, and the amber indicator light will come on. Make sure that the device is compatible with the system and placed with the chargeable side in the center of the charging area. 3. When charging is completed, the green indicator light will come on. Depending on the device, the amber indicator light will stay on. Metal objects between the charge pad and the device to be charged will get hot and can burn you. Always remove foreign objects from the charge pad before charging the device. Be sure the surface is clear of dust and other debris before charging. Do not spill liquids (i. e. water, drinks, etc.) on the charger and the device. Do not use oil, grease, alcohol, benzine or thinner for cleaning the charge pad. Do not cover the system with towels, clothing, or other objects while charging etc. Avoid spraying aerosols which may come in contact with the charge pad surface. This system consumes a lot of power. Do not use the system for a long time when the engine is not running. This may weaken the battery, making it difficult to start the engine. When using the wireless charger, check the user’s manual that came with the compatible device you want to charge. Perform one of the solutions in the following table. Green & Amber Blinking simultaneously There is an obstacle(s) between the charging area and the device. Remove the obstacle(s). The device is not within the charging area. Move the device to the center of the charging area where is located. Amber Blinking The wireless charger is faulty. Contact a dealer for repairs. Do not place any magnetic recording media or precision machines within the charging area while charging. The data on your cards such as credit cards can be lost because of the magnetic effect. Also precision machines such as watches can go wrong. ’Qi’ and marks are the registered trademarks owned by Wireless Power Consortium (WPC). The temperature of the device is extremely high while charging. You are at a place that emits strong electromagnetic wave or noises, such as a TV station, electric power plant, or gas station. A device may not charge if the size or shape of its chargeable side is not appropriate for use with the charging area. Not all devices are compatible with the system. During the charging phase, it is normal for the charging area and device to heat up. All the doors and the trunk are closed - to avoid interference with the proper functioning of the smart entry system. The position of the device is altered. Do not charge more than one device at a time on a charging area.